Are you looking for a chemical-free, natural flea product? 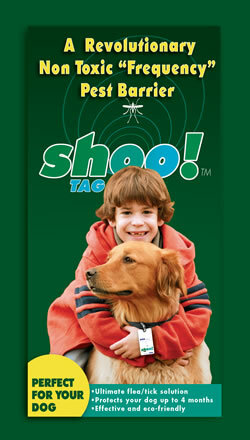 Shoo!Tags for dogs from Energetic Solutions may be your answer. The shoo tags remain effective for 4 months. They use electromagnetic frequencies that combine with your pet's energy to create a barrier to keep pesky fleas and ticks away. Do they work? Read for yourself. We wanted to share our customers feedback on the shoo!tags. 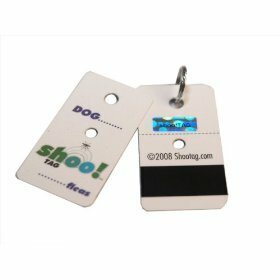 We have been using the shoo!tags for dogs since their introduction. Once we did our research on the side effects of topical treatments such as Frontline the decision was easy. Our home is nestled into a very wooded area in North Carolina and this year has been the year of the flea. The mild winter all over the U.S. has really taken it's toll. The flea population is very much alive and in full force. If you are doubting if the shoo! tags work, give them a try for 30 days. If they don't work, we will refund your purchase price. No problem. We also carry other natural flea products including shampoos,dips,sprays, diatomaceous earth. Mickey's Pet Supplies offers very inexpensive shipping at only $3.85 for First Class Mail or $5.95 for Priority Mail. You will find the lowest prices on many natural pet products for cats and dogs and FREE shipping on your order of $75 or more.